You and your friends may have several questions about your upcoming day of adventure here at Pocono Whitewater Rafting, Pocono Biking and Skirmish Paintball. What should I wear? What do I bring with me? Can I make a reservation? Are there restrictions? We’re here to help. To assist in the planning of your day we have compiled a list of the most frequently asked questions. Furthermore, if you think of a question not listed here, give us a call at 570-325-8430. Do you prefer to email us? 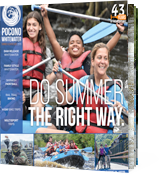 Emails can be directed to info@poconowhitewater.com. You can also reach out to us on Facebook and Instagram. How do we reserve our rafting, biking, hiking and/or Skirmish Paintball trip? Decide which one of our exciting Outdoor Adventures you want to try – Pocono Whitewater Rafting, Pocono Biking, and/or Skirmish Paintball and what day you would like to come, then tell some friends. Be sure to check out our Events Calendar! Then call us at 1-800-WHITEWATER (1-800-944-8392) or BOOK ONLINE. What about a deposit for my whitewater rafting, rail trail biking, or Skirmish Paintball trip? For Pocono Whitewater Rafting OR Pocono Biking, a $10.00 per person deposit holds your trip date and time. For Skirmish Paintball, we require a deposit of one entry fee per 10 players. For example, when making reservations for eleven to twenty people, we require a deposit for two entry fees. When making reservations for 21 to 30 people, we require a deposit for three entry fees and so on based on increments of ten. Credit cards are accepted over the telephone or you may send a check or money order. Payment in full must be received 10 days prior to the day of your trip. If you are mailing payment, please send to: Pocono Whitewater, 1519 State Route 903, Jim Thorpe, PA 18229. Don’t forget to include your name, phone number and reservation or customer number. What is your cancellation policy for rafting, biking, hiking and Skirmish paintball? Cancellations made more than 10 days prior to a trip may be rescheduled or refunded. If you cancel within 10 days of your trip, we would be happy to reschedule or send passes to come back when you can. We’re going whitewater rafting! What apparel do we bring? Riverwear in the spring & fall should include wool socks, wool/fleece hat, wool/fleece/pile sweater, windbreaker, and windpants. For summertime family rafting fun bring your bathing suit, shorts, rivershoes or old sneakers. Always remember to dress for the weather. Bring eyeglass straps if you wear glasses. In the great tanning months of June thru September, remember to bring your sunscreen. Never forget a towel and change of dry clothes, but don’t bring them with you on the raft. Otherwise you’ll have a wet towel and no dry clothes at the end of the day. Leave them in your car and get them after the trip. NO FLIP FLOPS & NO BARE FEET! What about wetsuits for our whitewater rafting trip? Wetsuits are State-mandated until May 1st of every year. You may bring your own wetsuits on your whitewater rafting adventure or rent one of ours. Rafting Wetsuit rentals are $15.00 for a full rental (top and bottom), $10.00 for 1/2 rental (top OR bottom), $10.00 for a rain jacket, $6.00 for booties and $6.00 for a water gun rental. Do we have to bring lunch on our whitewater rafting adventure? Lunch is good to have every day! We have a variety of subs available in The Broken Paddle Bar & Grill each morning. If you are coming rafting with a group of 10 or more people, we do ask that you please pre-order the subs from us at least one week in advance. Please visit our Food Page for options & details. Don’t forget there is a FREE Hot Dog BBQ LUNCH on our family style rafting trips from Memorial Day to Labor Day, and on weekends in May, September and October. Are the river guides in our raft? Our professional guides will be in kayaks alongside your raft. If you have special needs or feel you would like a river guide in the raft with you, we would be happy to do so for a $25.00 fee, based upon availability. Just be sure to let us know two weeks prior to your trip date. In-raft guides are not available on Whitewater Dam Release Saturdays. Pocono Whitewater Rafting strives to provide a professional, knowledgeable and courteous rafting staff. If you feel your river guides have exceeded your expectations – appreciation in the form of a tip is okay. Typical tips are 1-2 dollars per guest and should be given to your river trip leader for distribution to all members of your guide team at the end of the day. Do we need to fill out a liability waiver? Yes. Every person that is rafting at Pocono Whitewater is required to fill out a liability waiver. Anyone under the age of 18 needs a signature from a parent or guardian. Everyone will receive a liability waiver when you check in. You can also download your liability waiver, fill it out, and bring it to Pocono Whitewater the day of your trip. Are there health and weight restrictions on whitewater rafting trips? Yes, the Lehigh River is a free flowing wild river with changing water and weather conditions. You should be healthy and capable of getting back in the raft should you fall out. If you have excessive weight for your height or have a disability which would hinder or prevent you from getting back into the raft, we do not recommend this trip for you.With everyone’s safety in mind, we reserve the right refuse passage to individuals whom we believe present a risk to themselves and other guests. Can we reserve 2-Day Adventures, such as dam release whitewater rafting & Skirmish Paintball OR family style rafting & Pocono Biking? YES! If your group would like to do a 2-Day Adventure with us – any combination of Rafting, Biking, Hiking or Skirmish Paintball is possible AND we have great discounted rates for you. At Pocono Whitewater, we run our rafting trips rain or shine. If you decide that you don’t want to raft in rain or similar weather, you can reschedule your trip or cancel your reservation. In accordance to our cancellation policy, if it is within 10 days of your trip, we will send you passes to come back and raft with us. These passes will be valid for 2 years. What’s the weather at Pocono Whitewater? Check it out… Click Here for weather in our area. What do the river rapid ratings mean? River rapids are classified from I to VI. Class I River Rapids – Easy, small regular waves, minimal steering necessary. Class II River Rapids – Slightly more difficult with small drops and waves. Class III River Rapids – Numerous, irregular waves with drops and holes. Class IV River Rapids – Very difficult with cross-currents, fast water and large irregular waves. Class V River Rapids – Extremely difficult with exploding waves, fast and powerful currents, cross-currents, large drops and heavily obstructed riverbeds. Requires skill to navigate. Class VI River Rapids – Ultimate limit of navigability. The Lehigh River has Class I, II and III rapids. What are your policies on safety? We have maintained an excellent record of safety over the last 42 years. However, any outdoor adventure activity offers varying degrees of inherent natural risk. The individual’s concentration on the task and various other factors contribute to your whitewater rafting adventure. 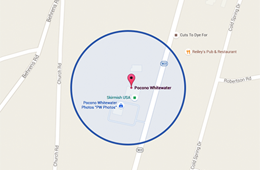 Therefore, Pocono Whitewater cannot assume responsibility for property loss or personal liability. If you question your physical abilities, please consult your physician. You will be asked to acknowledge your acceptance of these conditions before your day by signing a waiver of liability form agreeing to participate at your own risk. Click here for a copy of the waiver form. Have each member of your group fill out a waiver and bring it with them the day of your trip – this will speed up your check-in process! How many people go in a raft? Most of our rafts accommodate 4 to 6 people! If you have less than 4 people in your group, there is a possibility you will be put into a raft with other whitewater rafting guests. Can I go whitewater rafting if I can't swim? Yes, you can still go whitewater rafting. Knowing how to swim is not necessary but you do want to have a basic comfort with water and the ability to stay calm should you end up in the river. You will be given a life jacket and whitewater safety briefing prior to your trip departure. Your life jacket is to be worn at all times on the river. If you are concerned with not knowing how to swim, we recommend trying our family style whitewater rafting trip first to make sure you are comfortable in the water. What age is considered youth? For our family style rafting trip, everyone ages 4 and up are welcome to raft. Anyone ages 4 through 12 is eligible for the youth pricing. For our dam release whitewater rafting trip, everyone ages 8 and up are welcome. Our dam release whitewater rafting trip has one individual rate. Pocono Whitewater does not rent kayaks, sorry. We offer professionally guided whitewater rafting trips on the Lehigh River. What's the difference between the Upper and Lower Gorge? The Upper and Lower Gorge have the same river ratings of Class II & III rapids! They are simply on different sections of the river. When you do the Lower Gorge raft trip, you will have a beautiful nature walk down to the river. When you do the Upper Gorge raft trip, you will have your nature walk after your trip! There is no difference in price or river rating. Lunch is not included with either of these trips. What is included in my raft trip? With every raft trip at Pocono Whitewater, guests will get a paddle, life jacket, bail bucket and water resistant bucket to use for the day. If you are on a Family Style Raft Trip from Memorial through labor day or on weekends in May, September or October, you will get a free riverside BBQ! If you are on the Upper or Lower Gorge Raft Trip, you can bring your own lunch or purchase lunch at the Broken Paddle Bar & Grill before your trip! You do not need helmets to raft on the Lehigh River. Helmets are only necessary on Class IV+ rivers. The Lehigh River is class I through III only. If you wish to wear a helmet, they are available upon request. Yes, we offer gift cards for all of our activities – Pocono Whitewater Rafting, Rail Trail Pocono Biking and Skirmish Paintball. Gift cards can be purchased for any monetary amount and be redeemed toward any activity or item in our retail stores. To purchase a gift card, just give us a call at 1-800-WHITEWATER (1-800-944-8392). Shipping is FREE!